In the days of the Spectrum, when you were limited to 48 KILOBYTES of memory (less when you take reserved areas of memory out of the equation), making a game within such a constraining amount of memory was an achievement on its own. Making a game with 4 distinct sections was even more of an achievement, and then to deliver them without the need for “multiload”? Unthinkable!!! 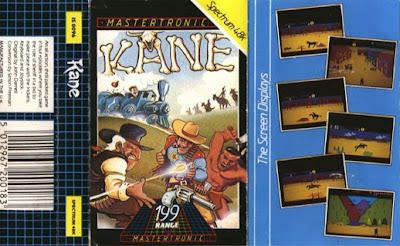 But back in the good old days Mastertronic did exactly that. “Kane” was the name of a town in the old Wild West, and it was there that you, as a cowboy of some description, decided to head, for whatever reason. First you have to get there, so along the way you decide to shoot some pigeons with a bow and arrow. Using a set of crosshairs, simply take aim and fire, not forgetting to lead the pigeon by a suitable amount. Every time you hit one, you’ll get your arrow back, and every 3 pigeons will award you an extra life for the next sections. Once you’re out of arrows (or miss enough pigeons), the level will end and off you head towards Kane. The next sub-game, the Ride to Kane is a horseback ride to the town. Along the way you must jump over giant lettuces and prickly bansai trees lest you be pitched head-first off your horse at the cost of one life. Once you reach Kane, it’s straight into a Shoot-out. The bad guys will pop out from behind their hiding places and take pot shots at you, whilst you must shoot enough of them to progress to the final stage. This level is very much like a primitive version of Cabal, only not so easy to dodge the randomly fired shots. To finish off is the very difficult challenge of the Train Chase. This is another level like the Ride to Kane, except this time you’re trying to catch up with the front of a runaway train. The obstacles are diabolically placed to cause maximum upset. The thing to remember on this one is that running at medium speed will only keep you level with the train, you have to run flat out to gain on it. I never quite managed this (I did come close a couple of times), but then this is how it should be, completion of a game is for the elite, not everyone like it is these days with our “interactive movies”, which are used as a sorry excuse for “games” these days. One of the best features of this game is the graphics. Barely any colour clash, superb fluid animation, and attention to detail, as well as the famous parallax scrolling. Thanks to the wonders of emulation, there’s no reason why you can go and play this in the next few minutes. 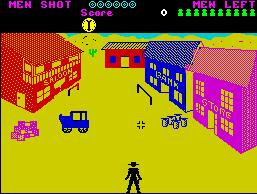 The World Of Spectrum archive is your friend…To be fair, at the time of release the game was widely panned, but I liked it, and that's all that matters to me when I write reviews. Maybe you'll only play it once. I played it plenty more than that.